The Montelupich prison, so called from the street in which it is located, the ulica Montelupich ("street of the Montelupi family"), is a historic prison in Kraków from early 20th century, which was used by the Gestapo in World War II. It is universally recognized as "one of the most terrible Nazi prisons in [occupied] Poland". The Gestapo took over the facility from the German Sicherheitspolizei at the end of March 1941. One of the Nazi officials responsible for overseeing the Montelupich Prison was Ludwig Hahn. 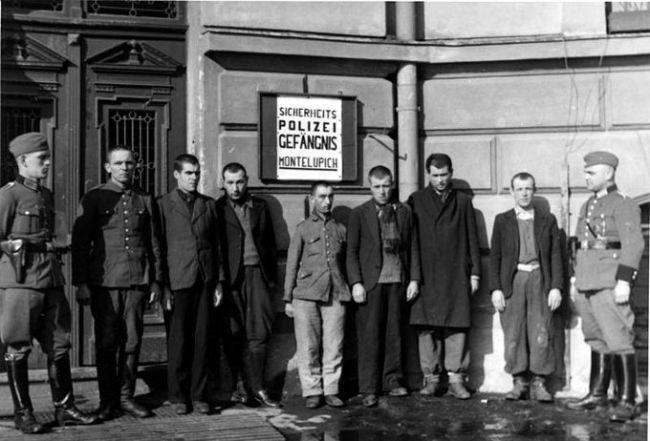 World War II prisoners at Montelupich were made up predominantly of the ethnically Polish political prisoners and victims of the Gestapo street raids, but also German members of the SS and Security Service (SD) who had been sentenced to jail terms, British and Soviet spies and parachutists, soldiers who had deserted the Waffen-SS, and regular convicts. The number of political prisoners who passed through or ended their lives in the Montelupich in the years 1940–1944 is estimated at 50,000. Kurkiewiczowa (see Bibliography) states that "medieval tortures" constituted the fundamental and principal interrogation method of the Germans. Although the inscription on the plaque by the (side) door of the prison in the 1939 photograph pictured at right actually reads, "Sicherheits-Polizei-Gefängnis Montelupich", the name "Montelupich Prison" is strictly informal, based on common popular convention, even if it has now passed in that form into history. The Montelupich facility was the detention centre of the first instance used by the Nazis to imprison the Polish professors from the Jagiellonian University arrested in 1939 in the so-called Sonderaktion Krakau, an operation designed to eliminate Polish intelligentsia. In January 1944, 232 prisoners from Montelupich were executed by a Nazi firing squad at Pełkinie. In late January or early February 1944, Wilhelm Koppe issued an order for the execution of 100 Montelupich prisoners as a reprisal for the unsuccessful attempt on the life of Hans Frank. In the locality called Wola Filipowska near Krakow there is a monument commemorating the execution by the Nazis of 42 hostages, all Montelupich prisoners who died on the spot before a firing squad on 23 November 1943. After World War II Montelupich became a Soviet prison where NKVD and Urząd Bezpieczeństwa tortured and murdered Polish soldiers of the Home Army. At present, the building serves as a temporary arrest and detention facility for men and women, with 158 jail cells and a prison hospital with additional 22 cells. The building housing the prison was not originally constructed for its purpose, but instead, was a historical property that was redecorated in the Italianate Renaissance style in 1556 by the Italian Montelupi family who introduced the first postal service in Poland for the court of Sigismund III Vasa. Their Kraków manor house, known in Polish as the Kamienica Montelupich (Palazzo Montelupi in Italian), at Number 7 of the street to which it gave the name, was the starting point of the first international postal coach in Poland which departed from here for Venice in 1558. The Jalu Kurek Park (see Park Jalu Kurka) in Krakow was formerly the palace garden of the palazzo Montelupi. The prison was the site of the last administration of the death penalty in Poland, performed by hanging on 21 April 1988. Despite being officially recognized as both a historical monument and a place of martyrdom, the facility continues to be operated to this day as a combination of remand prison and ordinary correctional facility by the Polish Prison Administration (the Służba Więzienna), a unit of the Polish Justice Ministry. Its current official name is Areszt Śledczy w Krakowie. The infamous history of this facility continues to the present day, as evident in the 2008 death of the Romanian detainee, Claudiu Crulic (1975–2008; see Claudiu Crulic), an incident condemned by human rights groups (such as the Human Rights House Foundation of Oslo, Norway) which occasioned the resignation of the Romanian Foreign Affairs Minister, Adrian Cioroianu. On inquiring about Montelupich, on Montelupi Street, when I was in Krakow on 18 August 1986, I was able to view it from outside and learned that even today, while still operating, it has not lost the evil reputation that it had during the Nazi occupation. Stanisław Frączysty (1917–2009; legendary courier of the Armia Krajowa, 1940–1942; in October 1941 personally guided Marshal Edward Rydz-Śmigły, the Commander-in-Chief of Polish Armed Forces, on his secret passage from Budapest in Hungary to occupied Warsaw; arrested by Gestapo in February 1942 he was first incarcerated in the Hotel Palace (see Hotel Palace) in Zakopane, the other infamous Gestapo torture site in Poland, and later transferred to Montelupich: he was subsequently deported to Auschwitz and Dachau for the remainder of the War; after the War, in 1949, arrested again by Polish Communist régime on fake charges of espionage, he was eventually released without having been brought to trial; on 28 May 2006 he met with Pope Benedict XVI at Auschwitz; see Stanisław Frączysty). On 24 January 1948, twenty-one Nazi German war criminals, including two women, were hanged at the Montelupich Prison as a result of the death sentences handed down in the First Auschwitz Trial. Their names are listed below along with the names of the Nazi war criminals executed at Montelupich at other dates.